Finnish developer Jussi Pakkanen was frustrated by existing build systems with foolish syntax in configuration files and unexpected behavior. During the Christmas season of 2012, he therefore decided to develop his own build system that would run fast, be reliable and easy to use, run on all major operating systems, and integrate important test tools like Valgrind. Just two months later, Pakkanen published a first version of his build system, which as a trained physicist he named for the Meson particle. Since then, the technology has advanced quickly. Version 0.17.0 – the latest version when this article was written – is already extremely stable despite its low version number and contains all the features planned by the program author. Meson is written entirely in Python 3 and is released under Apache License 2.0. One minor drawback, however, is that currently, Meson can only handle source code in the programming languages, C, C++, Java, and Vala. Meson does not bundle the source code into the appropriate compiler itself; rather, it simply generates configuration files for an existing build system. 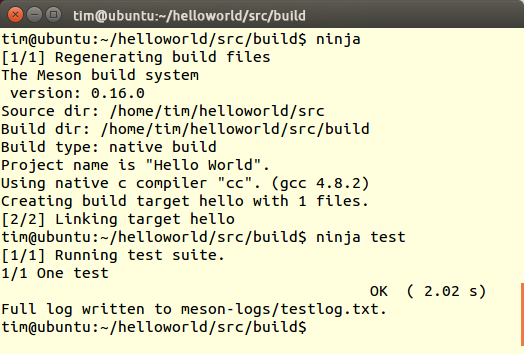 Under Linux, Meson generates build files for the relatively unknown but quite nimble Ninja mini-build system. Alternatively, Meson outputs project files for Visual Studio 2010 or Xcode. Meson refers to all of these external tools as back ends. then downloading the current Meson version and extracting the archive. A new project is defined by the project() keyword; it expects two arguments: the project name and the programming language used. 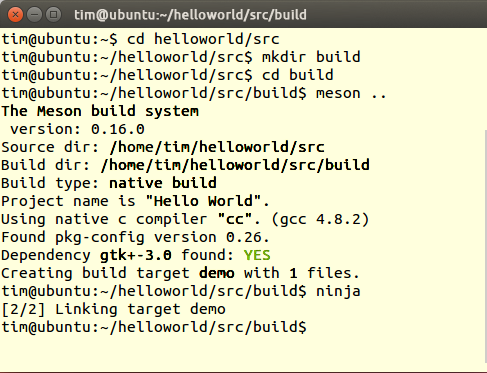 In Listing 1, the project is called Hello World; its source code is in the C programming language. Armed with this knowledge, Meson can automatically select the correct compiler. C++ programmers would use cpp as the second parameter. Strings need to be framed in single quotes, and a “#” introduces a comment; Meson ignores everything that follows a hash mark until a newline occurs. The second line in Listing 1 defines a new variable named src. This in turn expects an array with the names of the translatable source code files. The square brackets create the array here. In addition to arrays, variables will also accept integers (num = 123), logical values (right = true), and strings ( name = 'Peter'). You do not need to specify these values explicitly (dynamic typing); however, they cannot be converted from one type to another. Finally, the developer must always define a build target in meson.build. It determines whether Meson should output a library, a program, or both. To compile your source code, you first need to create a new subdirectory that stores all the output from the compiler. This build directory is mandatory: Meson insists on a separate directory and cannot be tricked into storing the object files in the source directory. This apparent tutelage has several advantages: for one, it keeps the files output by the compiler separate from the source code, improving understandability, especially of complex projects, and making sure the object files do not fall into the clutches of a version control system. On the other hand, you can simultaneously create several independent builds with different configurations. Thus, one build directory could contain the release version while a second houses a debug version. Figure 1: If you call meson from the build directory, as shown here, you simply need to specify the source code directory. Ninja automatically integrates all available processor cores. 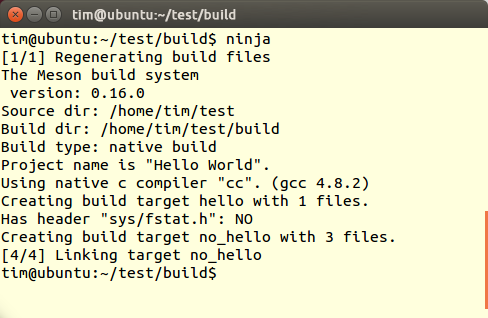 If you later want to recompile your program, a call to ninja in the build directory is all it takes. Further commands are not required. Meson has set up Ninja so that it automatically detects source code file changes and only rebuilds these – even with a subsequent edit of the meson.build file. By default, the compiler inserts debug information in the binaries and outputs all warnings. If the GCC C compiler is used, Meson enables the -g and -Wall parameters. If you need an optimized program for a release, you will want to call Meson with the --buildtype=release parameter. How to take further control over the compilation process is reveals in the “Full Control” boxout. Alternatively, you can simply specify a different prefix: ninja install --prefix /usr. 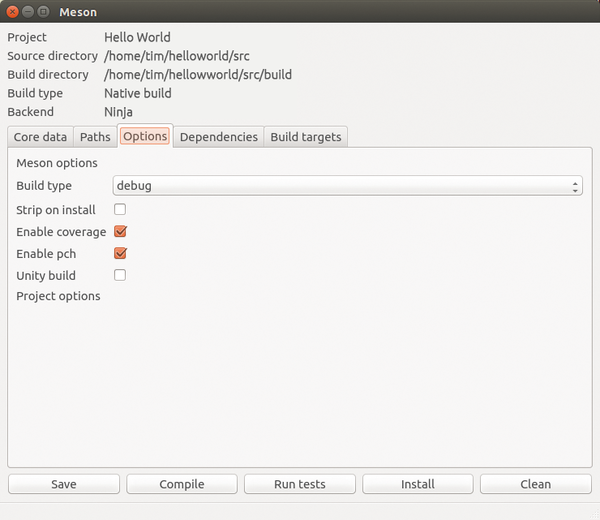 On Linux, Meson always uses Ninja as the back end. A project for Visual Studio 2010 is created by the --backend=vs2010 parameter; Meson generates the equivalent for Xcode with --backend=xcode. Ninja can also install the compiled program directly. To this end, you just call ninja install. If you use the functions defined in lib2.c, you will probably want to check them with a test program first. You do not need to link this against the complete dynamic library – just against the lib2.c object file. Many other objects support methods that programmers can call and use in a similar way. Meson supports if conditions that allow for more elaborate tests. Listing 2 shows an example: In a C project, it checks whether the sys/fstat.h header file is available. To be able to do this, Meson is handed the compiler in the first line. The second line then asks the compiler whether the header file exists (Figure 2). Figure 2: Ninja tells you the result of the if statement in its own output later on. In this case, this leads to an error in building the no_hello program. Meson allows simple unit tests whose definition is demonstrated in Listing 3. Here, the test() function defines a new test case A test. It starts the hello program and passes the --debug and --encode parameters to it. Before this, Meson sets the environmental variable HELLOLANG to the value EN_us and the environmental variable HELLODIR to the value /opt/helloworld. If the hello program returns 0, the test is passed; any other value means a failure. Figure 3: Ninja can run automated tests. Here, the software has passed the test called A Test. On seeing this line, Meson automatically runs Gcovr against the program; its output ends up in the coverage.xml file in the meson-logs/ directory. Based on the same principle, you can embed Valgrind and Cppcheck. Meson offers many other possibilities. For example, the tool produces appropriate pkg-config files on request; it supports localization with Gettext and allows the use of cross compilers. Before compiling, the tool generates configuration files on demand, such as the common config.h. This template system built into Meson helps with this; for example, it automatically replaces the @version@ placeholder in the #define VERSION "@version@" line with the matching string (1.2.3), as defined in meson.build. You can also define completely new build targets. Enabling and using these features usually only involves adding a few lines to the meson.build file. A very detailed and comprehensive guide can be found on SourceForge. Open questions are answered by the FAQ and on the official mailing list. Meson does not support IDEs yet, but the build system provides an API that any developer can use to integrate Meson into their favorite IDE. A simple GUI is in its infancy (Figure 4). If you want to accelerate its build, check out the two options in the “More Speed” box. Figure 4: Meson includes the mesongui graphical front end; currently this only lets you change a few settings via mouse click. Parsing the header files from system libraries can take up a fair amount of time. Precompiled headers provide a remedy. The compiler then parses the header files once, and then saves its internal state in a file on your hard disk. During the next build, the compiler simply references the state in this file. To further optimize the build time, Meson supports unity builds. You first dump the contents of the source code files into one big file and then feed it to the compiler. This measure can reduce the compilation time by up to 50 percent depending on the project. However, if you modify one of the files, the compiler has to recompile the complete source code. For this reason, unity builds are disabled by default in Meson. To enable them, to pass the --unity parameter to meson. The rest of the work is done by the build system; there is no need to glue the source code together yourself. Although Meson is still quite young, the build system is remarkably stable and already meets all the requirements set by Pakkanen. In particular, it takes some work off the developer’s hands: If you previously had to deal with automake tools, you will probably not want to do without Meson. The current version is already production-capable and well suited for medium-sized projects. However, Pakkanen expressly indicates that his implementation is still a proof of concept and that much could change in the course of further development. Pakkanen also announced that Meson would soon find its way into the Debian package repositories.